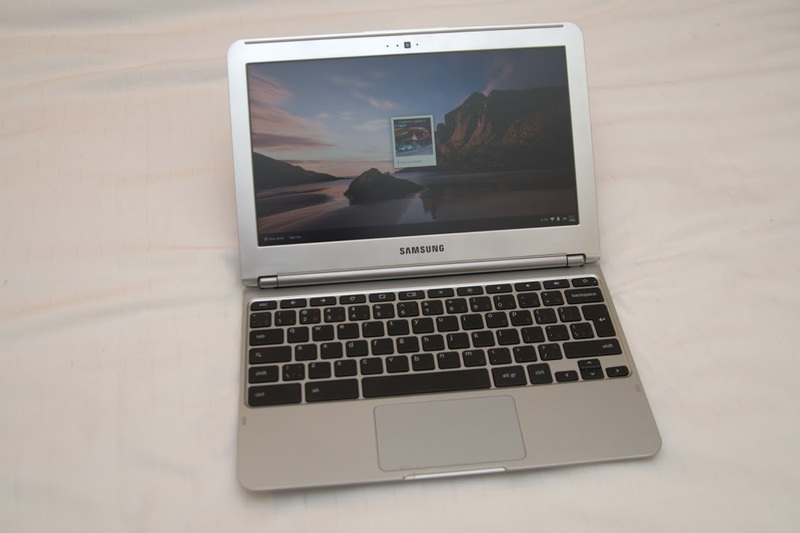 My review of the Samsung Series 3 Chromebook is based on having it for about 3 weeks. To understand why I really enjoy using the device, here’s a little background before jumping into the details of the review. I had been debating about getting a new computing device for a while now. I currently have a MacBook Pro that I absolutely love and does everything that I want still but it has a couple of shortcomings. The first is that the battery doesn’t last as long as it used to and the problem is compounded because I have 2 hard drives loaded in it. The other is that it gets hot to touch after a while. However, as a device that’s plugged in at my desk and hooked up to my Apple Thunderbolt Display, it still does it’s job incredibly well. Decent keyboard – I want do some light work including writing out long email responses as well as moderate surfing for research. I also need to log on to servers to write SQL statements as well as do work with servers. I debated among four devices – the MacBook Pro with Retina Display, MacBook Air, Microsoft Surface and a Chromebook of some sort and ultimately settled for the Google Chromebook. Among the Chromebooks, I debated between the Samsung Series 5, Acer and Chrome Pixel, Samsung Series 3 and settled for the Samsung Series 3 Chromebook. All in all, the specs for the Chromebook is rather unimpressive with the exception of the price and weight. It is very reminiscent of a small MacBook. The silver colour, the function keyboards at the top, the trackpad that has no buttons, and the trackpad navigation features (two finger right click, two finger scroll up and down) are all very MacBook’ish which made the transition very easy for me. While it does look like a MacBook, it lacks the finish of one. It feels extremely cheap and plasticky. As I got the Canadian version, it comes with an international keyboard that makes typing a bit frustrating for me. Despite my negative remarks describing the product, it is truly an effective product for me. The Chromebook without any modifications is truly a browser attached to a keyboard. As I am someone that is deeply entrenched in web applications and sometimes very specifically Google web applications, this is a truly ideal device for me. I had originally purchased the Chromebook as a travel machine. Something that I would carry with me whenever I wasn’t at home given it’s lightweight and long battery life. I had only expected to do minor surfing on it, answer a few emails and use IM to quarterback the development from it while I was away from my primary laptop. I find myself using the Chromebook around the house in the evenings. It’s nice to park my laptop at my desk and use this device to write my blogs, organize my thoughts and even plan my tasks. As I’m able to SSH from the Chromebook, it also allows me to do some lightweight work on my servers when I need to. Looking at my devices, the Chromebook fits between the Nexus 7 and the Macbook Pro. I like the Nexus 7 for consuming information like an e-reader and do light weight communication and my 15” Macbook Pro is meant to do a lot of heavy lifting when it comes to programming or if I have to open up multiple screens at the same time for me to do intensive work. There are other features I haven’t explored yet – such as the HDMI output, the USB 3 connector as well as using the SD card slot. It’ll be interesting to see if the 2GB of RAM starts to become a problem for more extensive use of the device. To summarize, the Chromebook is a lightweight, cost-effective device if the majority of the work you do is via online web applications.